If you haven't been introduced to decoupage yet, you've been missing out! Pasting beautiful papers on to unused items or specially selected objects creates a gorgeous finish that both adults and children can appreciate. Cass Art stocks a range of materials from Decopatch - a whole host of large and small animals to decoupage, glues, varnishes and of course the pretty papers themselves. Decopatch have developed their papers so that they're as thin as they can be, whilst never tearing or allowing the colours to run. The glues and varnishes are non-toxic and washable, so they're perfect for use in the home. To start, select your papers and rip them up into strips or pieces about the size of a fingerprint, this will create a patchwork effect and mean the paper covers the contours of the object better, you could cut your paper into fun designs and shapes for instance stars or spots. Cover an area of the object you'd like to begin with the Decopatch glue, use the brush to pick up the pieces of paper and then smooth down onto the glued surface. Continue to cover the object with lots of glue and paper, smoothing out any wrinkles or bubbles that crop up along the way, and remember the glue dries clear at the end so be generous with it! Once dry you can add jewels, stickers and paint to enhance your decoupaging! If getting sticky with Decopatch isn't looking likely - try out the Drawing for the Artistically Undiscovered book by renowned children's' illustrator Quentin Blake and James Cassidy. Loaded with advice on how to develop your drawing technique and with practice pages along the way, this book is bound to keep kids entertained for hours. Included alongside the book is a selection of pens and pencils. For ages 8+ this book is equally suitable for adults needing a few tips and a confidence boost. Once acquainted with the pencil and paper it might be time to invest in your own! Cass Art stocks a vast range, recommended for beginner's would be the Cass Art heavyweight cartridge paper pads (heavy enough to use paint and ink on but light enough to cut and fold) and a selection of pencils, this Faber & Castell set comes in a handy tin and ranges from HB to 8B in weight - perfect for young budding artists. Not the digital kind - there's tons of fun to be had with ink and a stamp. From the old school potato printing to the whole alphabet, printing is a pleasure for everyone. Ideal for card making, use the NPW Typewriter printing set to stamp out your message. The set comes with blue and red inks but if you'd prefer there's more ink pads to choose from thanks to Aladine's assorted pack - and what's more, they're completely washable! 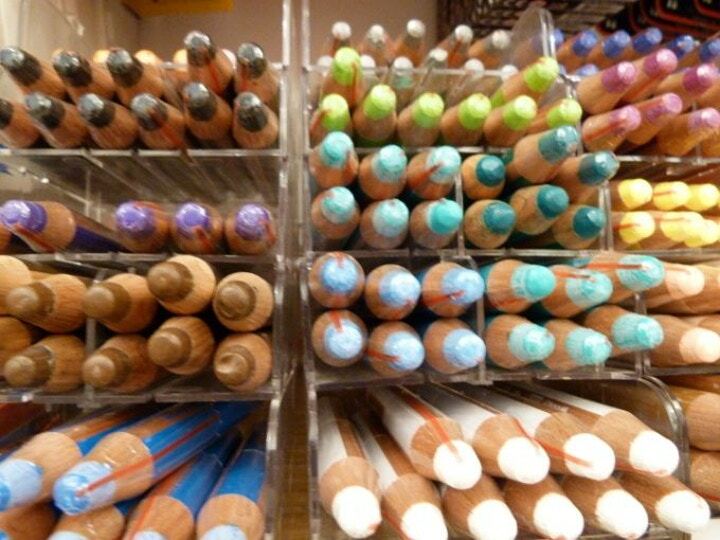 Shop online now and remember to follow Cass Art on Facebook and Twitter for the latest on art materials and ideas for creativity at home!